Recently I attended an Australia Council Market Development Skills Workshop at the Queensland Writers Centre. Jaki Arthur the Campaign Manager at Hachette Australia lead us all through a day of learning how better to spruik ourselves and our writing in the marketplace. I came away having learnt an enormous amount – mainly about what I’d been doing wrong!. Bust also feeling as if the work of writing was valued and important. And that’s not something to be sneezed at. 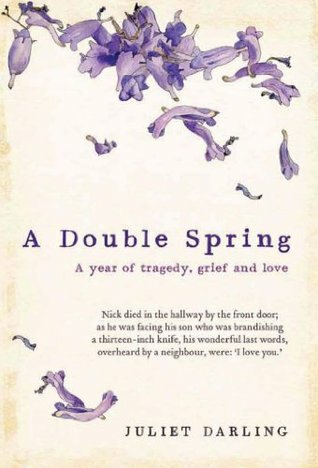 This is a beautifully written book about the first year of traumatic grief after the murder of a partner. It is full of the raw emotions of grief – anger and pain, but also love and the beginnings of faith. Darling’s partner Nick (a famous patron of the arts) is portrayed as a wonderful man, though he wasn’t quite perfect. That Darling lets us us know this is one of her strengths. Nothing is hidden in this memoir. It is a rare and courageous writer who can lay herself so bare. I couldn’t help but imagine that if my brother, who also suffered schizophrenia like the murderer in this book, had not killed himself at twenty, I may have ended up writing just such a memoir of murder. It is a travesty that it is so difficult to get the dangerously mentally ill hospitalised. A point rammed home by this terrible and avoidable tragedy. What inspired me most about this book was that Darling never once got angry with God. She got angry at everyone else, understandably, but never the Divine. It seemed that through the priest Steve, who was a steadfast and wise friend as Darling struggled in the huge dumping waves of loss, she was able to find a way to peace and healing.